Weygandt’s Managerial Accounting 4th Canadian Edition is written by a highly trusted and respected author team - Weygandt, Kieso, Kimmel and Aly. Hundreds of thousands of students have been successful using books written by these authors. Again, these authors bring you a one semester, undergraduate text that presents the fundamental concepts of managerial accounting in a concise and easy-to-read fashion. This edition retains the same features that made it popular in the previous editions: it gives students all the necessary techniques and concepts of managerial accounting in a focused, concise framework with an excellent pedagogy that's been praised by instructors. It does this by focusing on the tools students need to succeed. 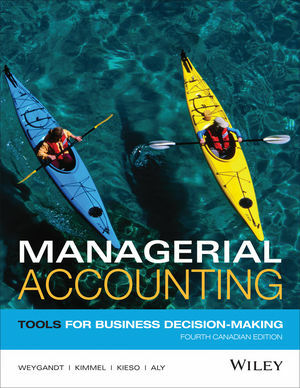 Because not all students taking this course may be accounting majors, the authors have focused more on building decision making skills; on how to use accounting information to make quality business decision; and on the tools needed by future managers. Pair this book with our new Managerial Accounting Cases by Carty and Wick for a complete solution for your Managerial Accounting needs. Donald E. Kieso, PhD, CPA, received his bachelor's degree from Aurora University and his doctorate in accounting from the University of Illinois. He is currently the KPMG Peat Marwick Emeritus Professor of Accounting at Northern Illinois University. He has public accounting experience with Price Waterhouse & Co. (San Francisco and Chicago) and Arthur Andersen & Co. (Chicago) and research experience with the Research Division of the American Institute of Certified Public Accountants (New York). He has done postdoctorate work as a Visiting Scholar at the University of California at Berkeley and is a recipient of NIU's Teaching Excellence Award and four Golden Apple Teaching Awards. Professor Kieso is the author of other accounting and business books and is a member of the American Accounting Association, the American Institute of Certified Public Accountants, and the Illinois CPA Society. He is currently serving on the Board of Trustees and Executive Committee of Aurora University, as a member of the Board of Directors of Castle BancGroup Inc., and as Treasurer and Director of Valley West Community Hospital. Eight new feature stories and several new business insight boxes help to ground discussions in the real world. Integrated company coverage using a real-company example further emphasizes the real-world focus of the text. Current Designs, a kayak-making company with Canadian origins, is introduced in Chapter 1. We then follow up with a decision-making problem in every chapter based on this real-world company. The Decision Toolkit System allows students to focus on key decision-making concepts and is integrated throughout the text. The All About You feature links a specific chapter topic to the students’ personal lives by presenting the topic, offering some facts about it, posing a situation for students to think about, and offering alternative answers as a starting place for further discussion. End-of-chapter assignment material is adapted from the CMA and CGA's professional examinations. Weygandt’s Managerial Accounting Video series showcase real companies such as Starbucks, Jones Soda, and Zappos in 5-6 minute segments. Active Learning is encouraged using several unique pedagogical tools integrated throughout the text such as the Navigator, Do it!, Action Plan and Before You Go On. Service Industry coverage is emphasized in this text to reflect the Canadian economy, as it is increasingly comprised of service companies. WileyPLUSnow features ORION, our adaptive learning tool. WileyPLUS is a research-based online environment for effective teaching and learning. WileyPLUS is packed with interactive study tools and resources–including the complete online textbook–to give your students more value for their money. With WileyPLUS, Weygandt students will get accounting by doing accounting.